The Yesware Email Tracking Add-in allows users to craft, send, manage and improve personalized email communication to those outside their organization. To do so, Yesware brings powerful features including email tracking, customizable email templates, CRM integration, and automated email Campaigns to users. Pros: Yesware is very user friendly which makes it easy for adoption within a sales team. Not only the web version of the product but the chrome and gmail add-ons work really well. Additionally the feature set is very powerful and makes the lives of any sales/hunter/prospector easier. Cons: There is not much (or anything) to dislike about Yesware. It is a very rounded product and I have never had a single issue with it. I would like to see a native mobile application so I can work better on the go. 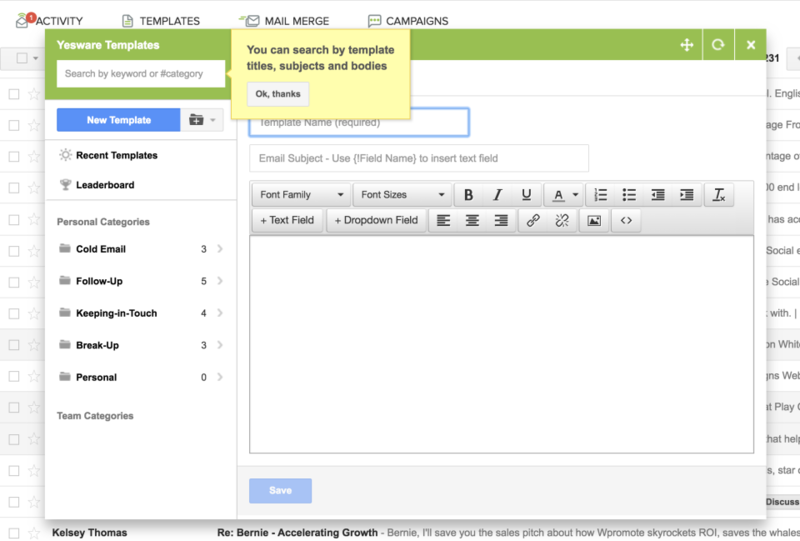 Overall: The first thing that attracted me to Yesware was the email tracking feature. That gives the sales rep the ability to know when things are happening on the side of the potential client so you can act on it. Then the email templates helped me a lot to get things done faster. I could see which templates performed better than others, hence improve my results. In addition you can create teams and share better working templates with everyone for them to use as well, that way you can maximize the impact of a good sales rep by sharing his findings with the whole team with a few clicks, instead a monthly template session. Lately what I've been using a lot is the touchpoint feature which allows you to build custom multi-touches multi-channel campaigns. It makes a sales rep day-to-day job a lot more easy when you can visualize quickly what's next to be done and where are the potential clients in the buyers journey you design for them. Pros: The visibility created from email tracking is extremely useful! I love knowing when someone opens or clicks on an email. In addition, I save a ton of time by using the templates feature. All my emails also sync directly to Salesforce, which saves a ton of time and energy and keeps me organized! Mail Merge and Reporting are also neat, although I use those less frequently. Cons: The email editing software is a bit wonky on the web, but works great within gmail. That's really the only con I have - everything else is top notch! Overall: Yesware helps me be efficient, effective and productive as a sales rep. I also am able to see which emails perform the best (both individual and on a team basis). Knowing when someone opens or clicks an email is great leverage in the sales cycle! I of course never mention this to the prospect, however it allows me to manage my pipeline effectively. Pros: Easy to get going, easy to use for basic mail merge and template needs. Team functionality is cool. Cons: Lack of customizability makes it frustrating for more advanced users. Overall: I want to love yesware. I've been using it for over 3 years, at 3 different companies. It does the basics pretty well--set-up and send mail merge, schedule future emails, and store templates. The problem is that as much as our team has asked for features to increase the customizability of emails, time of send, etc...we have not gotten them. The yesware team asks for a lot of feedback, and we give it. But unlike other software companies I give feedback to, they don't seem to actually take the feedback. Recommendations to other buyers: There are lots of similar tools on the market--look at each one to see which fits your needs--they are all a little bit different. Pros: -Ability to sync emails and activities with CRM. Pros: 1. Email delivery confirmations are SO helpful. The instant notifications are great as well as the ability to find delivery details on a specific email in history. Plus, not requiring a read receipt to get the confirmation is huge. Cons: It doesn't play well with my Gmail screen - it covers the bottom of the email where my email attachments normally show up - so it's hard to verify the right attachment is attached - or to delete it. Overall: Convenience & delivery confirmations. Pros: Email tracking is a huge deal for us. While most CRMs offer it, they don't offer the ability to see who opened the email if you sent it to more than one person. They just tell you "someone opened your email". This was annoying to us so we found Yesware. Not only will it tell us who opened it, when, where, on what but it can also do amazing things like tell you if/when someone opened your attachment, how many times, AND (here's the kicker) how long they looked at the attachment. After the free trial, which is an ample 30 days, we were hooked. Oh! The notifications! Most systems gave us notifications in their system so we would have to keep going back to see notifications. Yesware gives me popup notifications, in real time, no matter what I'm doing on my computer so I always know when someone opened an email. Also, the price is not bad. It's really worth it. Cons: It takes a while for the system to learn who is who. After a few emails though, it can tell me "Customer service opened you email" instead of "someone at Company A opened your email". Overall: The most robust email tracking software with the most reasonable price tag. Pros: It is eye opening to be able to track emails you send and the clicks and opens they generate. By knowing what happens with your emails on the receiver's end, you change your followup strategies. Cons: Nothing we not like about Yesware. We're not using the Campaigns feature as we have other software for that, and that is not their core functionality. Overall: Yesware gives our sales team extra insights about emails they send as well as time-saving tools to follow up and remind prospects. Pros: I was introduced to this software at my first SaaS job, and wish I had been introduced to this at the beginning of my career. I love knowing when a prospect is opening my emails and forwarding it within an organization. It also allows me the opportunity to reignite cold conversations. Cons: Didn't integrate too seemlessly with SFDC and customer support is something left to be desired. Overall: Fantastic as long as you are OK with some problems with CRM. Pros: So I actually used Yesware when it first came out and merged over to the paid version for a little while. I left my company and didn't need. Now that I have my little side hustle going, I came back to Yesware and can truly say it has been a vital point for email tracking, attachment tracking, setting reply reminders, and using templates. Prospecting hasn't become a pain and I'm in love with the new Appointment feature! Cons: I don't have any "Cons," but more so a gripe. 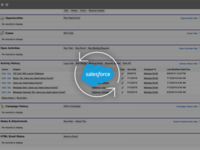 Yesware's only CRM integration is with Salesforce. I'm a solopreneur and Salesforce is way too big for me. I use a different, free, CRM that suits my needs and it's a popular CRM that has many other integrations... except Yesware. It would be nice to be able to integrate with Yesware with other CRMs. The only way to "integrate" is to save outbound emails via bcc with your CRM's custom email that will sort your emails inside of the CRM. Pros: 1. The product's cost/value proposition is one of the best out there. Cons: 1. Some additional information about how Yesware would integrate with other CRM's would be helpful...however, I can probably Google the answer. Overall: Let's me know whether prospective clients opened up any or all communication that I sent them. Love this product!!! 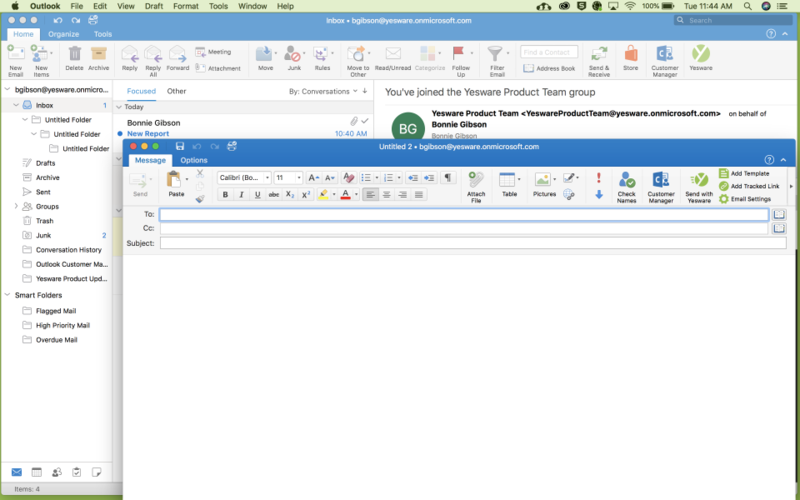 Pros: Yesware's mailmerge and templates are some of the best in the industry in terms of ease of use and overall function. The read receipts and reminders were a nice plus as well and I never had any issue with the usability of the product. Cons: There are now better products on the market - available for less. Vocus.io is the tool we are now using which has all the same features as yesware, but then adds even more and is nearly half the price. While I liked using yesware, it is not something I see myself using now that the market has moved beyond it. Pros: There are a lot of sales software similar to Yesware but I would say Yesware is one of the best. There are a few other softwares like outreach and salesloft but they are considerably more expensive. I love Yesware and it does the job. Cons: It does lack features for salespeople who are looking to build lists of prospects and a few other features but you know that going in to it. Overall: Yesware was one of the original pioneers of software for salespeople. While it's become increasingly competitive, I'd still say it's a great choice, especially for reps who are responsible for the full sales cycle, reporting and forecasting for themselves. 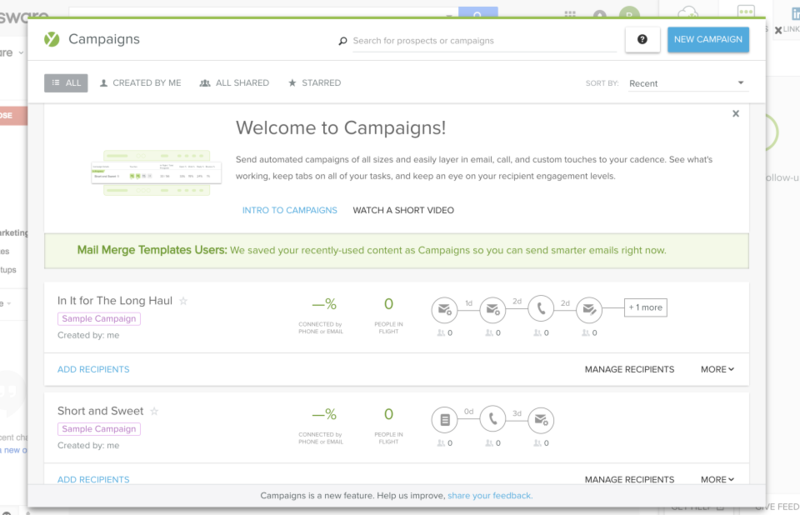 Now standard features like email analytics to let you know a prospect opened an email or clicked a link were magical. Since they've layered on a bunch of other features like dialers, step cadences, predictive analytics. In the end you have a lot of choices here, but I recommend taking them up on their free trial period and decide for yourself. Recommendations to other buyers: Free trial offer is worth it! Pros: Excellent product & value. If you want to close sales this will help you! Know exactly who is opening your emails, clicking to your website, and checking you out on social media. Cons: No cons so far! Long time user with no issues. Overall: Yesware has been an integral part of my sales funnel success. When I've needed to speak to someone, they are always there to answer questions & assist. Pros: We've tried several different solutions for tracking emails, creating new leads, and hosting email templates for quick use and found Yesware to be the best. It's easy to use, clear, and was easy to set up with our CRM (Salesforce). Cons: Nothing - I've used it in the past (2 years ago) so I'm trying to figure out the new look and feel. Pros: real-time tracking of the e-mails, clicked links, and engagement. you can attach documents which will give you reports on time engaged and pages scrolled through on that specific document. Cons: the ability to save a sent email as a template would be great. because it is running in the background and can slow down my browser a little. I love using Yesware. One of my favorite softwares for work. Pros: The thing I like the most about this software is that it will tell you not only when someone opens an email but actually what they are clicking on and looking at within the email. Cons: The thing I like the least is that sometimes it won't sync to a certain email and the tracking tools won't work. This happens very, very rarely. Pros: Yesware seems to have the best email tracking - telling you exactly who, when, and where they opened the email. It was easy to set up, use, and get data from it. One of my colleagues used it for months and was able to share with us exact details from her cold emailing to help us refine her approach and be more effective. It's also one of the first I think that started doing this and it makes a huge impact when you're sending hundreds of emails a week, like we often do in our company. Cons: My only issue with yesware is that it seems other software has very similar features built in. Many people add email tracking - for example, we also use Nimble which has email tracking, and many other CRM's do. Yesware is simpler, more tools and data, but for our specific company I have a hard time seeing the extra value and paying for it when we already have the same basic service (email tracking) built in. Overall: Easy to use and share with others to use. Provides great data on email tracking! Pros: The mail merge function and SFDC integrations are my favorite part. 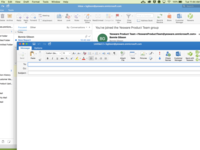 It integrates seamlessly with SFDC, and the mail merge functionality is easy to use (even for sales reps). Cons: I wish Yesware would work with more VOIP providers to act as an email AND one-click-call system within SFDC. Yesware helps you understand what messages come across as successful. Pros: I enjoyed that Yesware allowed for email tracking. When someone opened an email, you were notified. You understand that the subject line worked! If they open multiple times, you know they are interested. This helps significantly in the sales process. Cons: I did not find many negatives, although it almost seemed like an ad after installation. Overall: It helped me target customers that were actively interested in my message. I then knew who to focus on following up with. Great tool to enhance marketing through mail. Pros: It's an efficient tool to develop mail marketing and outreach clients that are mostly favorable for your product or are responsive to your mails. it can notify you about the opening of mails from the side of a client. Cons: It has disadvantage of not to setup proper time schedule to follow up proper mails to several specially engaged clients. Somehow, it also seems to be buggy and adding a new template will alter subject lines eventually. Pros: Real-time notifications when someone opens an email or clicks on an email. I also like that you can save and easily re-use email templates. Cons: I wish the interface was a little easier to use and the reporting software was more straightforward. Overall: You get real-time notifications when someone opens your email or clicks on a link in them which is very helpful when you have to follow-up with someone. I also keep email templates which saves a lot of time when reaching out to people. Cons: Nothing really, I guess the software could be cheaper so we can expand it to the whole organization. Yesware helps us cut down our emailing time! Cons: Can be a bit kludgy at times, working within Gmail. We often have to draft and format our emails in gmail itself, then paste over to a yesware template to preserve the exact formatting we want. Overall: This does save us about 50 hrs of straight emailing time per month! Very useful to track emails and when they are opened. This information is incredibly useful. Pros: The email tracking. Knowing when emails are read and how often they are viewed helps understand prospect interest. Cons: An alert pops up every time you view the email you are tracking. This can get annoying and clutter your alerts. The additional features like templates aren't explained very well. I'm sure I would like them, but I don't because of the fact I'd have to teach myself. Overall: Valuable insights on prospect interest. Pros: The tool is easy to use and simple. 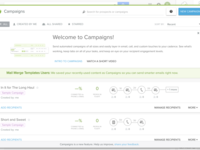 You can create email campaigns, track open and reply rates, and schedule when an email should be sent. This is a great way to track follow ups with your clients. Cons: There are a lot of email tracking tools out there and Yesware doesn't really have strong differentiators for me. I've used Outreach, Tout, they're pretty much all the same tool. Yesware has been incredibly intuitive and helped maximize conversions in our sales process! Pros: I love the transparency behind Yesware and it's reporting functionality to be more targeted in our approach. It offers great insight into what is working, and how we can better improve our messaging. Pros: Yesware is fantastic for tracking emails it's quick, alerts you when something has been opened and has great tools for checking opens of a single email thread. Cons: There's no doubt a lot more functionality here, but I never used any of it because I had no idea how. I'd like to see the software offer up tips to access those other features. Pros: The interface is very user friendly, with an attractive appearance. I think the layout is logical and it's easy to find what you need, even though some functionalities don't appear to be accessible from every page, which would be useful (for example, from the home page you can access templates but not campaigns). The reporting is useful but could be more extensive. What I find the best thing about this tool is that you can train a novice o use it in an hour, and they can really boost their sales productivity by setting up campaigns and templates. Cons: It would be useful if you could create a signature block which can be inserted into new templates (similar to Outlook), because when you copy/paste your signature into a template it requires a lot of formatting. I have used a similar tool called Tout and this was a good feature of that tool. Also, to insert an image you need to use a URL which is not easy to do and I feel it makes the process of inserting them too complex. Overall: Overall the experience has been very good. We have an inside sales team who use the tool and they see many benefits from it, including boosting productivity and tracking the opens/clicks that they get from campaigns and templates. Started Yesware wilth its free version, found it so useful went for the paid version. Pros: The email tracking, Campaign after all these getting the analytics of CTR & OTR gives really a much more clear picture for the marketing strategy. Cons: Nothing to say for the desktop usage...if Yesware can provide the Mobile App, it will add much more value for the management. They can take the marketing decision on the go. Pros: I like this software the most for business development. It allows me to have multiple people within 1 canvas email to where I can not only track the success of the outreach but create multiple touches to keep traction going. Cons: I have had a couple of issues uploading CSV files into the system but other then that have not had any issues at all! Overall: I love it so far. Have only been using for about 6 months but so far so good! Learning how to use it more efficiently day in and day out. Pros: It offers a lot of features, interface is intuitive and it is very easy to use. It gives you the option to save your templates, insert them when needed and saves time to communicate with your prospects. Cons: Sometimes the emails do not populate correctly and lags. For example, the name does not populate or the template. Overall: Simply to use, saves a lot of time to communicate with your prospects. The software is being updated and developing with time, unlike other vendors who do not update their platform. Pros: I love that I can create my own personal email sequence with content that I create. Quick, simple and easy to use. Great user functionality. Cons: I did not experience and major problems. The tool worked as well as I needed it to. Overall: Overall, I think it's a great tool that accomplishes what you're hoping to get out of it. Pros: I like the tracking and how you can see when are where an email was opened. My team uses the tracking to see what email is performing the best and we share our ideas. Cons: I wish there was more ability with outlook's scheduling, but I was told that was on the road-map so that is the only complaint. Pros: Email tracking is very well laid out in yesware and you can even sync them to third party applications like Salesforce. The email tracking is by far the most useful method of tracking metrics vital to a campaigns success. Open rate, reply rate and bounce rate are essential to mark. Cons: The grouping of certain metrics could be better, and the template editor should be more robust. I'm sure there's a way to do the templating externally but I feel this shouldn't be required for such advanced software. Overall: YesWare helped our business grow by setting up effective email campaigns. From newsletter style emails to cold prospecting it's a wonderful application for email management. 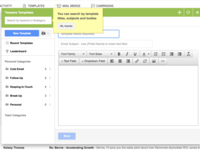 Pros: Good solution for email templates - easy to set up and use. Good email scheduling and tracking. Cons: Reformatting links used in templates. Email scheduling could be improved by adding "Send in X hours". Overall: I'm using Yesware's templates to send many mails from testdome.com every day, and it's been a very reliable tool. Great tool for sales people. Cons: Analytics not very useful. Not much data. Overall: Yesware is a very useful email monitoring tool at a great price. I have been using this for about 2 years and I enjoy the tracking and templates. Cons: I found Yesware sometimes had issues with my browser and Boomerang was a bit better with those issues. Additionally, I am not a lawyer but GDPR rules have made great tools like Yesware more complicated to use related to privacy rules of readers. However, overall its an excellent product and i recommend it. Pros: I like how you can send targeted email campaigns and do it quickly. I also like that it tracks your emails in real-time. Cons: I wish the plug in wasn't so buggy.- sometimes it connects to Salesforce and sometimes it doesn't. I hate having to reconnect them. Pros: I rely on "canned responses" a lot, and Yesware makes it so easy to personalize those responses by creating more of a e-mail template than a canned response. You're also able to track what e-mails templates get opened most frequently which is really beneficial when trying to figure out if your subject lines are effective. Cons: I've only been using this software for a few months, and have not yet encountered anything negative about it. Overall: Yesware has made my job so much simpler. As a template, the fields where I need to enter information are shown as RED if I forget to enter the proper information there, which makes it really easy to catch if you do a quick scan of the message before pressing send. Possibly my favorite feature is that you can share the templates with your team, so everyone doesn't need to create their own. Pros: Good email and document tracking, robust analytics, and easy automation. Overall: My team finds Yesware indispensable. Flexible product to help sales teams save time, become more effective and win more deals. Recommendations to other buyers: The email tracking feature is intuitive but many of the other features will require training to ensure adoption. Easy to use and incredibly helpful for dealing with inbound leads. Pros: Super easy to use! I have my templates I can use to respond to a high volume of emails fast and easy. Cons: When creating the templates, there isn't a variable input, so you kind of have to remember how to structure the variables. Excellent tool for sales efficiency for those that are cost conscious. 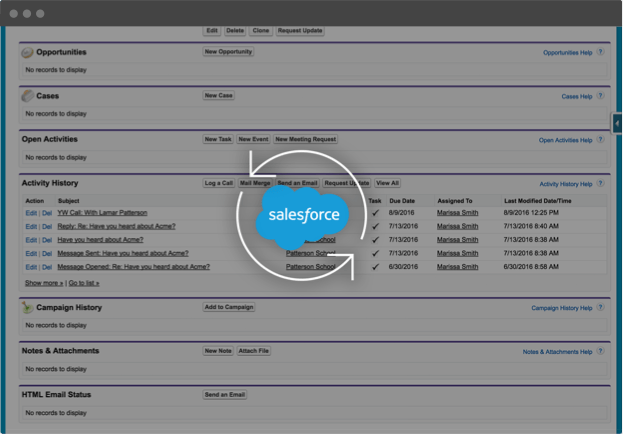 Pros: Amazing integration with Salesforce - makes the administration side of things easy. Templates are handy as you can insert the subject line as well + make it a part of the same thread to continue to use that subject line. Cons: I am just exploring their trial version. So far have not come across anything that is a big detriment. One thing is that it seems to log calls as tasks - so you just have to make sure you click 'completed' in order for it to log to SFDC. Not a big deal but would be nice it was just logged as an activity. Overall: Eliminate the adminstrative work in Salesforce, allowed for great email campaigns, easy to use templates and a pretty accurate view of how many times people are opening my emails. Pros: Our team loves the ability to keep track of when emails are opened, and how many times they are opened. Cons: Sometimes it fails to load and we are having to constantly refresh until it appears, but for the most part works great! Pros: The automatic syncing of emails to Salesforce is great, and seamless when paired with G-suite Mail. I'm a huge fan of their notification tool too to bubble up specific threads at any specified time. Cons: The touchpoints tool is nice, but needs the ability to integrate to a flow (i.e. a form submission from your site should automatically dump the lead into an SDRs touchpoint. Cons: - Probably not best for large teams, but works great for our smaller team and the price we pay for it! Cons: Would be great if we could add individuals to an existing campaign. Also there is no feature to stop an ongoing campaign until all the active recepients have been removed.